Wednesday should be dry for most of Colorado with the exception of the far northern mountains. A weak storm on Thursday will bring light snow and chilly air to the northern mountains, then following sunny and warmer weather on Friday and Saturday, our next chance for snow and very cold air will be on Sunday into Monday. The weather on Tuesday was mostly what we expected with sunny skies for central and southern Colorado while clouds and snow showers hung around the northern mountains. Just like every day of the past week, there were a few high-side surprises when it came to snow totals. Below are the totals from Tuesday morning through Wednesday morning along with a note about when the most snow accumulated. Clouds and snow showers are hanging over the far northern mountains but the rest of Colorado should see plenty of sunshine. Some mountains open for the season today! Backcountry - lots of snow, lots of wind = avalanche risk, please make good decisions and check the avalanche forecasts from CAIC. A weak storm will brush by the northeastern corner of Colorado. This storm track will bring a few snow showers to the northern and eastern mountains, though accumulations should be very light. The most noticeable impact from this storm will be temperatures on Thursday as highs will be in the teens to low 20s, or about 5-10 degrees colder than Wednesday. Sunny, dry, and warmer with highs in the upper 20s to mid-30s. 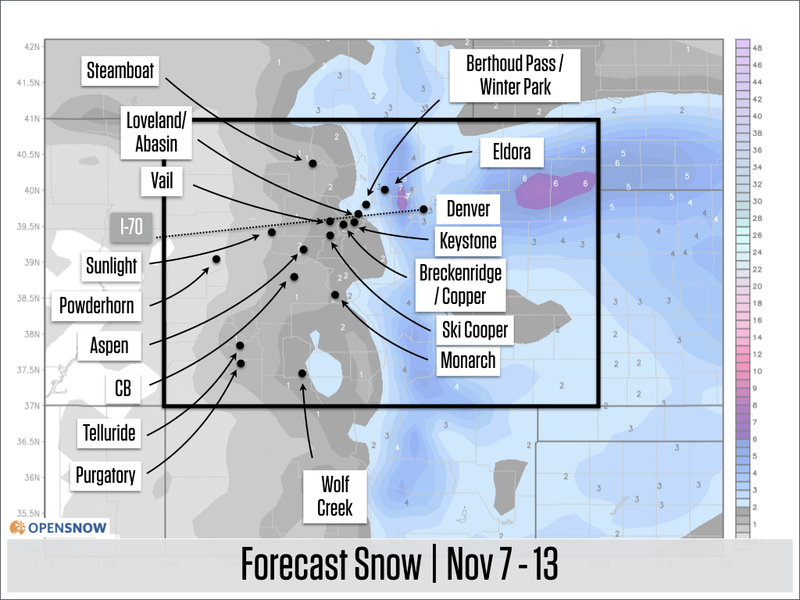 I’m not sure that this will be a significant system, but there is a chance for at least a few inches of snow, favoring the mountains near and east of the divide. Some forecast models show the brunt of the storm staying to our east, though other models (European, Canadian, Japanese) give a storm a more western track which would deliver more snow. The snowfall map shows lower-end totals, though with chances for deeper snow close to and east of the divide. 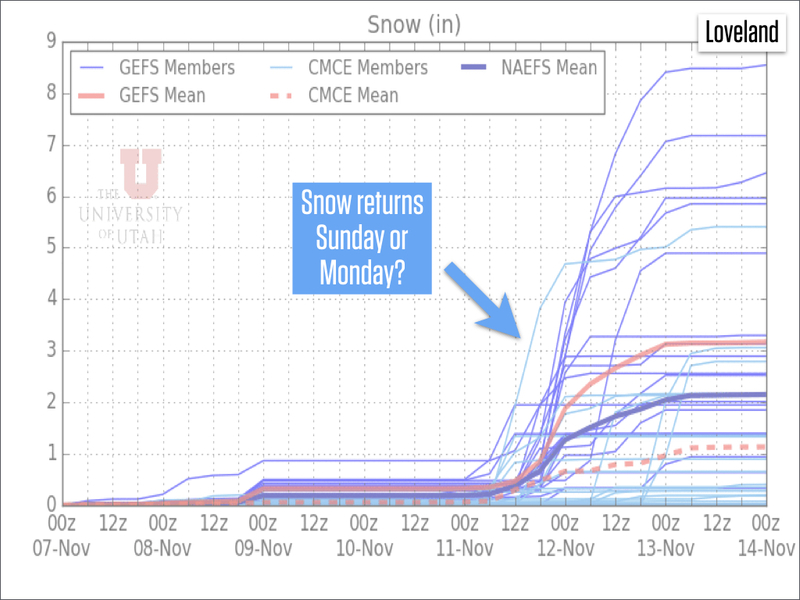 And the forecast graphic below, from the University of Utah, shows quite a range of possible snow amounts on Sunday into Monday (this is for the area around Loveland and Arapahoe Basin). Right now we're looking at 0-8 inches. That's a forecast that will be likely to verify! While the snowfall on Sunday into Monday is uncertain, the temperature forecast is more certain. On Monday expect potentially the coldest air of the season with high temperatures in the single digits and teens. I do not see any significant storms for later next week into the week of Thanksgiving. This somewhat makes sense because the storms that we’ve seen in October and November have been on a 3-4 week cycle (this relates a storm cycle that moves around the globe called the MJO). If past trends hold, then we may be in for a drier period during the middle of November, with stormier conditions possible later in the month and into early December. Remember that forecasts beyond 7-10 days are mostly inaccurate, so I’m only trying to give a general sense of what I’m seeing rather than an absolute 3 week prediction. My next update will be on Thursday, November 8.